My first post so please bear with me. Selling my 1982 Sho-Bud Super Pro 8X6 in a beautiful rose red finish. It's a real looker. Horizontal checking visible in a pic of the decal. A few tiny bar dings. 3/2 changer. Guy I bought it from said brackets are replaced and not pot metal. 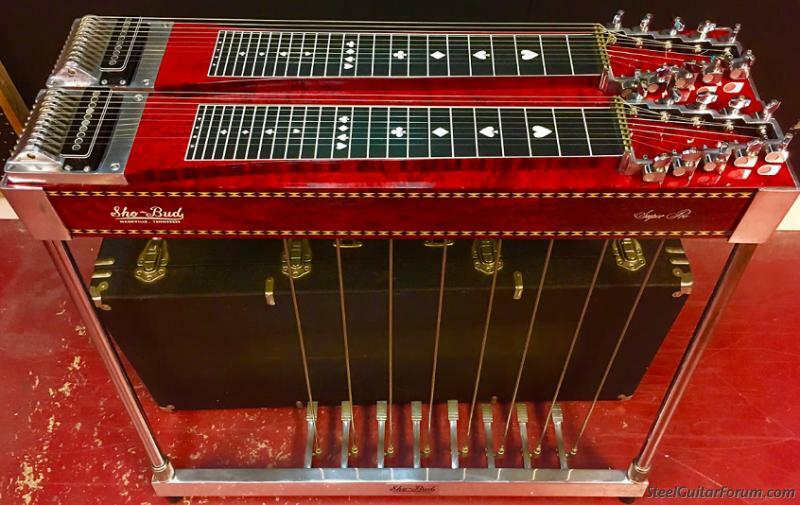 Has Truetone pickups both necks. 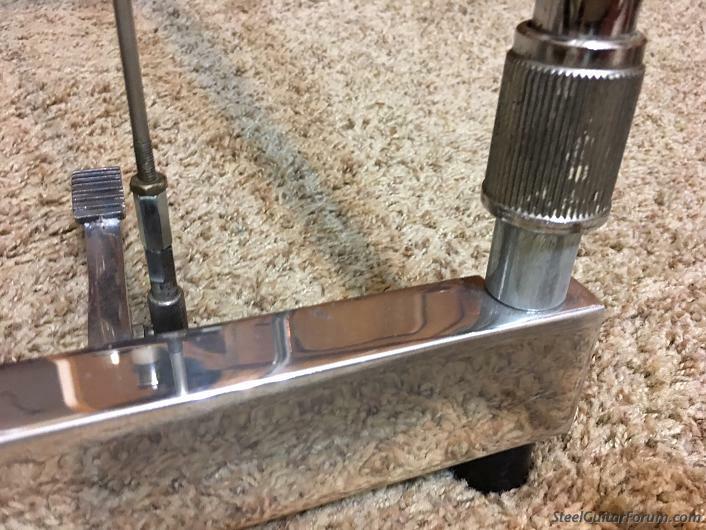 I extended the rod to pedal connectors with parts from the hardware store for my long legs, and am using metal collars between the pedal bar and leg adjusters to avoid the front legs creeping down. The extending parts all remove easily. 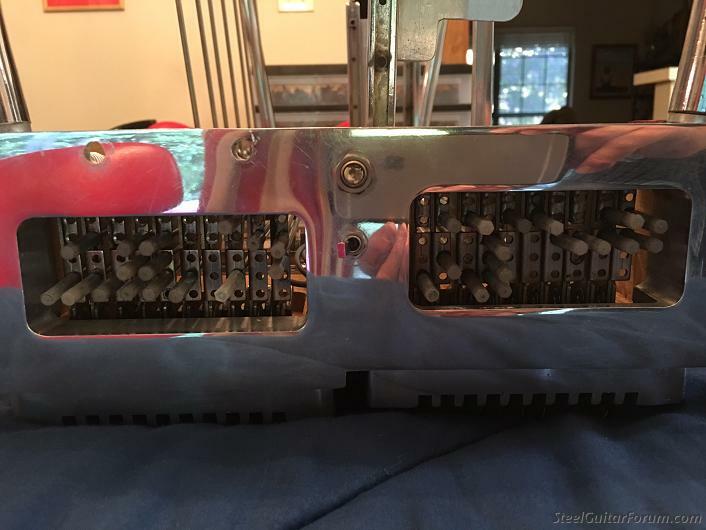 Copedent of E9 is: Emmons A, B, and C pedals. LKL- E's raised, LKR- E's lowered, LKV- B's lowered. RKL- 1st and 2nd up to G# and E and 7th F# to G. RKR- D# down to C# and 9th string D down to C#. I robbed an 8 inch rod off the C6 RKL since I don't really play C6 yet, and I took an unused bell crank from E9 RKR and moved it and that rod to the E9 RKL to get that 7th string to G thing mentioned above, as I once had on a Pro II Custom 30 years ago. Really wanted that change but didn't want to lose the 1st and 2nd raise thing. Never got around to buying another 8 inch rod for the C6 RKR. That unused bell crank from the E9 RKR shaft may have been for lowering the low B to A at one time. 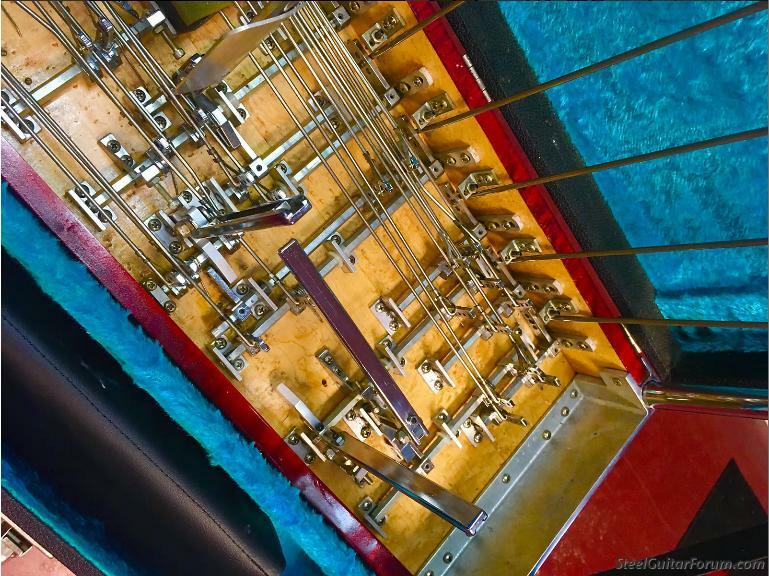 C6 copedent is: 4th pedal A's to B, 5th pedal G 5th to Gb, also 9th F to F# and 10th C to D. 6th pedal 2nd E to F and lower E to Eb. 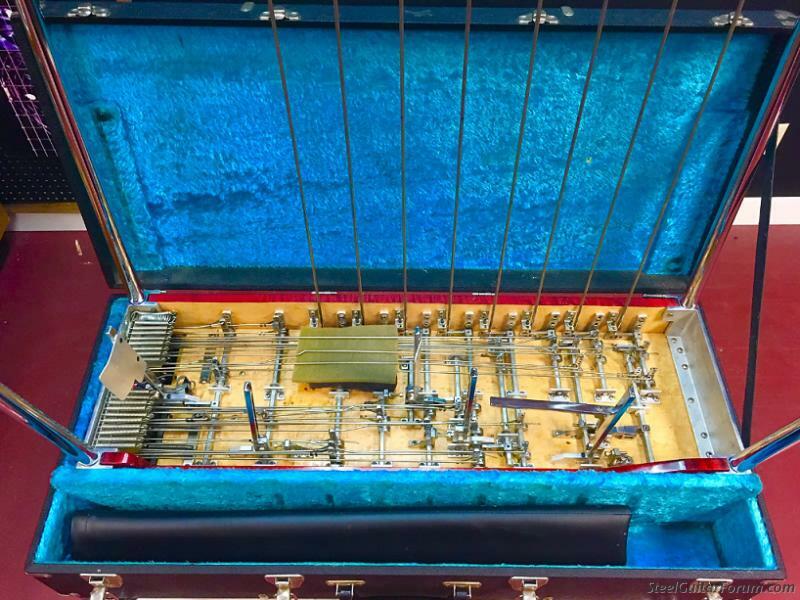 7th pedal 3rd string C to D, 4th string A to B. 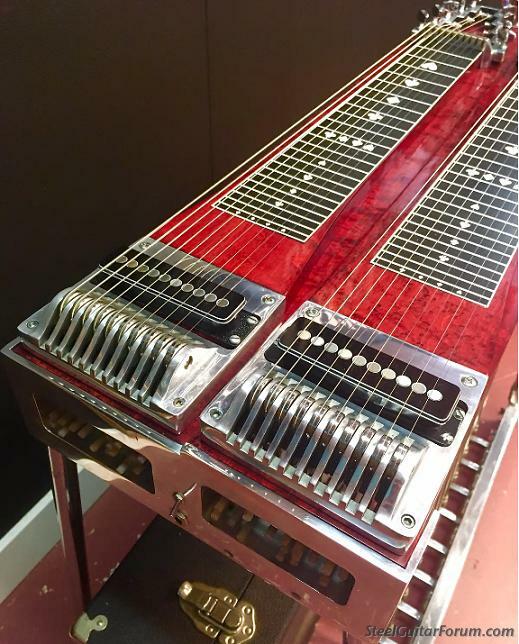 8th pedal 7th string to C#, 9th to E, 10th to low A. 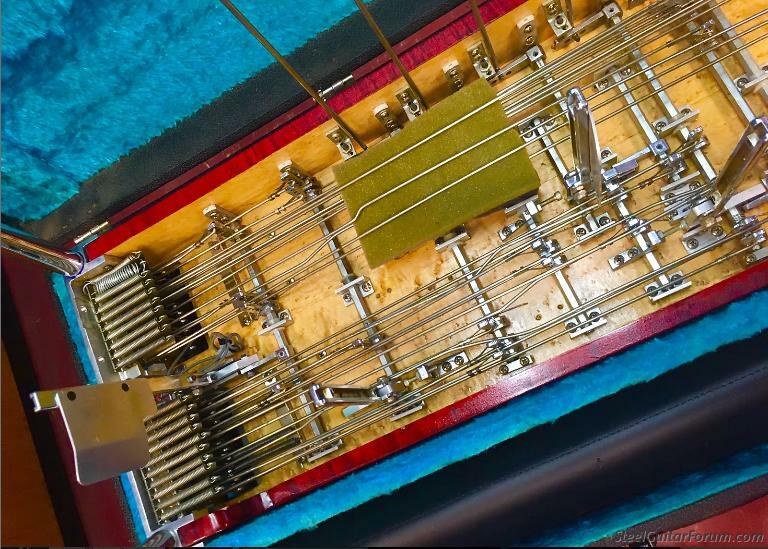 Left C6 lever in the middle makes 2nd string E an Eb, RKL C 3rd to B (once that 8" rod is replaced), RKR is A 4th to B. Case looks pretty good and is solid with decent lining and a leg/rod bag. Good handle. I am now asking $2900 shipped within CONUS. It won't be any lower - I've got to ship it and there's the very fair 5% donation to the Forum. Will consider a trade for an extended E9 (Sho-Bud preferably) with possible cash difference. 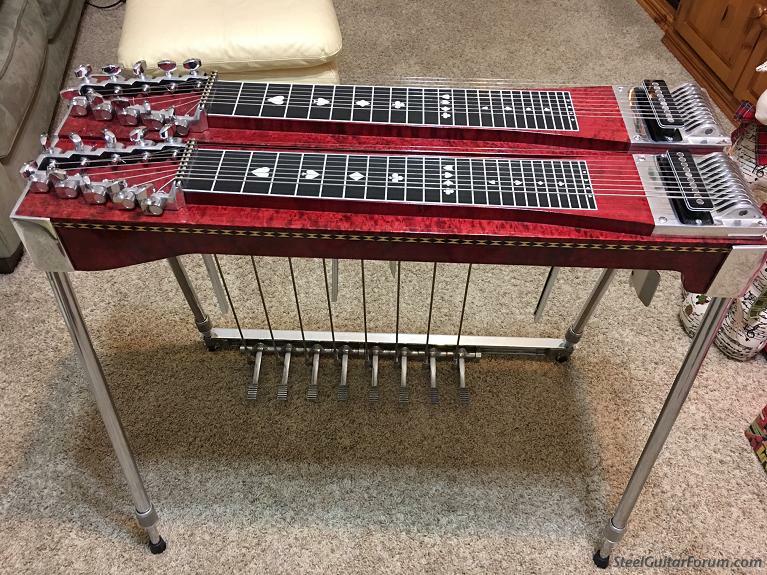 This steel needs to be played by someone who also plays C6. Thank you for reading all this! Please let me know if you have questions. Good luck with the sale Steve, that is a seriously gorgeous guitar! Thank you Chris and Colin. 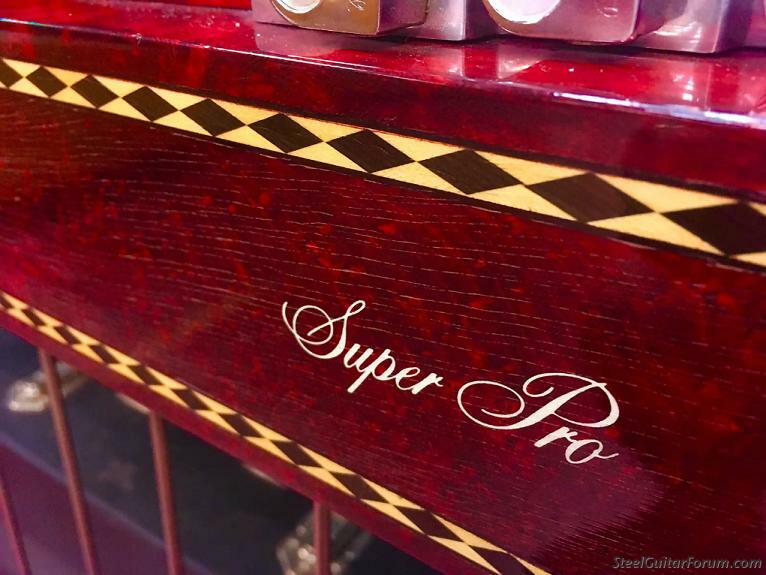 That is a VERY clean Super Pro!!! Thanks Dan. I wonder if we are related somewhere down the line. Can't see this one taking very long to move to a new home. Beautiful guitar. Thank you for the encouragement, Jeffrey. Yes, Dan, Lane is common, Laine a little less so (my wife and I met Denny Laine from Wings recently), and with the "y" pretty infrequently encountered. Wow Ricky, that's so nice of you to say all that. Actually it was '88 when we joined that band together- yours and my first road gig. Many great memories. You have grown and experimented musically so much over the years - Emmons and Peaveys to Sho-Bud and Fender tubes, Hawaiian lap steel, etc. , and with those changes ALWAYS a very classic approach mixed with your own feel. I hear Lloyd Green's influence all through your playing and what a great thing that is!! And folks here are surely well aware of your expertise regarding Sho-Buds. 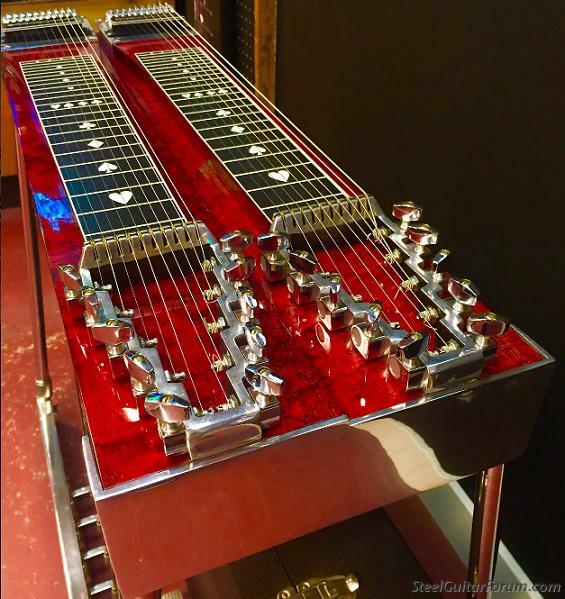 I've never known anyone personally that loves steel guitar as much as you do! Aw; thanks so much Steve for all your kind words...and yes you are right> "1988" cause that was the year my Student made the '88 Olympic Gymnastic Team and went to Korea....so then I thought; I've done it all as a Elite coach...now it's time to play music. I will never forget Steve; you taught be how to Hear and See music...Love ya Bro. Ricky one of these days I need to come visit, look at your guitars, and get you to show me some pointers.